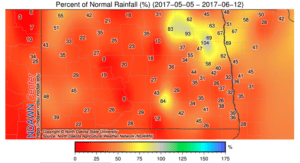 Before this rain event North Dakota had been experiencing a growingly severe drought, where some fields in Western ND had little or no germination in late planted crops. 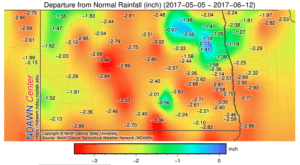 In today’s article, I want to review where our weather is with regards to corn accumulated growing degree days, and accumulated rainfall up to yesterday, June 12th. 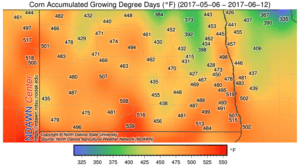 Using an example corn crop that was planted on May 5th as the average, I have included two maps below about accumulated growing degree days (GDD) and departure from normal for our GDDs. We are ranging from mid 500s down to high 300s across all of ND, so our crop has had ample heat to get started growing into the V stages. 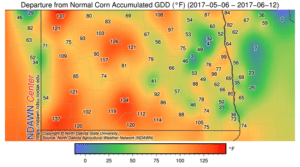 In western ND, we are around 100 GDD ahead of the 30-year average (normal), while in the eastern third of the state we range from at normal GDD to around 100 GDD ahead of normal. The take home with our first two maps is that heat has been average to slightly above average. Furthermore, given that most corn was planted into moisture and germinated nicely, this is reassuring. The second facet of weather I want to discuss, which is more prudent for our current drought, is rainfall. This first total rainfall map shows our accumulations since the date we used for planting of May 5th, not considering any rainfall before May 5th which would add to soil moisture stores. 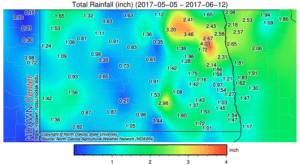 Despite a few localized regions where rain events provided two to four inches of rainfall, we have had below two inches across most of North Dakota over the past five weeks. The second two maps are more telling for our current drought in ND. Our percent of normal rainfall is well below 50% at almost every NDAWN location. We are over 2 inches short on moisture for this 5-week window compared to normal precipitation across the corn growing regions of ND, with the outlier being the far northern reaches of corn production where rainfall has been close to normal. What impact is this drought having on our corn growing season here in North Dakota, combined with the normal heat accumulations? A nice starter for this conversation is this chart by Corn Agronomist Joe Lauer from the University of Wisconsin, Madison. Yield loss primarily occurs when the corn plant is water stressed at the very late vegetative stages into reproductive stages. This yield loss is primarily linked to evapotranspiration within the corn plant exceeding water supply in the soil. Evapotranspiration comes from water lost at the soil surface and water lost by the plants during transpiration. At early growth stages, evapotranspiration is low due to low leaf numbers, leaf area, and plant height. When water stress occurs during vegetative development (which is what we are experiencing now) we can expect reduced plant height and a less vigorous plant (leaf area). Joe Lauer notes that leaf number is not usually affected by drought. If we can catch up on our moisture, our yield losses should be minimal from this drought that has occurred in ND spanning VE – approximately V6 corn growth stages. This is primarily due to our first yield component of kernel rows per ear nor being determined until around the V6 growth stage. Stress up to V6, besides low plant stands, will not have a large impact on yield components. To conclude, we can breathe a single sigh of relief with this rainfall event that just fell across North Dakota. However, in most locations this rain will not have been enough to catch us up to normal rainfall, so many of us will be glued to the weather forecasts hoping from some more rain before our summer quickly turns into the hot and dry July and August months. What happens within the corn plant when drought occurs. August 21, 2003. 10(22): 153-155.